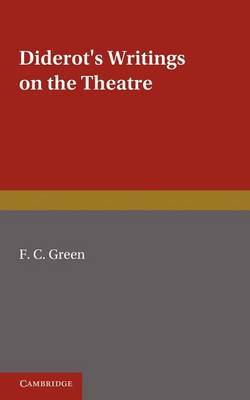 Originally published in 1936, this book gathers together Diderot's writings on theatre, providing the reader, in chronological order, with the unabridged meditations of Diderot on everything relating to the nature of drama. Editorial interference is kept to a minimum, and the use of explanatory footnotes is avoided save where their absence might have obscured the intended meaning. The texts are presented in the original French, with an English introduction. This book will be of value to anyone with an interest in drama, dramatic theory, and the position of Diderot in relation to them.